Give me olive accessories or give me…well, not quite death, that’s rather dramatic, but you know, a very mild punishment that proves how much I like the colour olive, okay? Like…a really inopportune power cut right as I’m about to settle down to watch that movie on Netflix that I’ve been looking forward to for ages. Yeah? So, give me olive accessories or give me a really–okay, you know what, you get the point, let’s just look at the damn shoes! You must know by now that I have a thing for velvet. With Christmas coming up fast, it’s the perfect time of year to get a bit plush and lush with some velvet on ya body, whether that’s as luxurious trim on a piece made from another fabric, a little glimpse of a velvet top layered under other items, or a full-on, can’t-be-denied, say-hello-to-my-velvet-dress! The latter, especially, is my favourite kind to flaunt for some festive fun, and thanks to Collectif I’ve added a truly stunning velvet number to my collection with this Clara dress. But as if the festive perfection ends there; paired with these rose gold beauties from Hotter Shoes–could I be any more ready for Christmas? I think not. Praise be and pass me the candy canes! I can’t be the only one who sometimes pictures a certain kind of dress I really want, but can’t find it anywhere. For a couple years now that has been my struggle for a sleeved black swing dress with a white collar. It sounds like something that you’d think multiple brands might produce, so simple but chic is the idea, and so well fitted to the concept of something we could picture Audrey Hepburn wearing. But no, instead, I have been destined to wait, to wait and to hope. 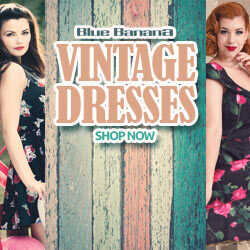 This season, finally, Collectif have answered my wardrobe prayers, and produced that perfect dress. She’s here–the Winona. I’m not usually one for lobster motifs. These little red critters are a popular novelty feature in the vintage realm, but the reasoning behind that has always flummoxed me. Who would want a crimson crustacean featured on their clothes? I wondered, confused, as my Instagram feed filled each summer with beautiful modern pinups buying item after item in lobster print. I just don’t get it. …And then, as always, I found the one dress that made me finally understand something I hadn’t previously, and now I’m like ‘lobsters? How cute!‘ So to whom do I owe the credit of this bending of my previously steadfast opinion? Collectif, step right up! It’s been an awkward spring this year, what with winter insisting on overstaying its welcome, but the sun has finally started to make a few appearances and I am more than ready for her to begin reclaiming her time. I have several fabulous new summer-loving outfits hanging in my wardrobe ready for the feel of fresh air and warm sunrays, but none more so than this Collectif Joice dress and Luzia heels combo, which absolutely scream SUMMER TIME to me. It might not be quite nice enough yet to hit the beach in this outfit for a boardwalk stroll and, of course, the eating of ice cream, but wearing it even on a slightly dreary day still has me experiencing all the summer feels. I know some of you, like me, have been waiting a long time for this post. This gorgeous olive striped Rosie skirt was part of Collectif’s AW17 line and was much admired in their previews, judging by the many messages and comments I received from ladies telling me they, like I, were in love with this skirt. We were all eager for it to turn up last Autumn, then still excited in winter…and before we knew it, it was 2018. Where was our beautiful Rosie? The answer is that she, gloriously versatile as she is, was moved to this wonderfully awkward in-between stage of the year as a transition piece between winter and spring lines. And, really, I can’t blame Collectif for that, because it makes a lot of sense; the stripes as a print are season-free, olive as a colour is just as footloose and fancyfree for looking good all year long. And looking at the weather, with snow descending here in the UK for our last few days of February, this skirt truly does work just as well for this cold, white blanket on the horizon as it would on a brighter, more spring-like day. It may be snowy now, but as soon as that sun comes back out and the temperatures start to increase, you can bet I’ll be busting this Rosie skirt back out with these boots replaced by some cute flats, the double layers shed for simple white top, and a cute wicker bag added to finish it all off. For now, though, let’s take a look at how good Rosie looks in the snow, because boy does she. I love olive green, a colour I believe is massively under utilised and under appreciated. Lucky for me, Collectif have taken up the charge for championing it this season with several olive toned pieces in their AW17 line, one of my favourites of which is this Jessie floral cardigan. Ah, Collectif; does anybody do coats better than you? Certainly I don’t think any other vintage inspired brand is as well known for their coats, especially when you consider the fame and fervor surrounding the yearly release of their Pearl coat. For me, it was the Riley coat that made my heart go a pitter-patter when I first glimpsed its preview, a coat so classic and beautiful I have already said a million times to anyone who will listen that I want to just wear it as a dress. I’m more than partial to a winter cape as well, so when the brainwave hit to pair the Paige velvet and faux fur cape with the Riley for hood coverage and extra warmth on very cold or drizzly days, I wasn’t just pleased with myself for the practicality of the idea, but downright obnoxiously proud of the glamorous combination it created. Behold, a pairing fit for most any winter wonderland! Here’s the thing about London Edge: there’s so many pretty things everywhere that the volume of them is almost numbing and you begin to act a bit like a greedy toddler hopped up on sugar in a vast toy store, leafing through the racks and mumbling ‘want, want, want’ about practically all the lovely things, far more than you could ever conceivably buy. It can take some serious self-restraint and concentration to organise your photo taking and mental cataloging throughout the day in order to best use the event as a way to plan out your purchases for the upcoming season being previewed. Sometimes I end up mentally dog-earring items I change my mind about later once they actually come into stock, when the druggish enthusiasm of the day has worn off. Considering that, my favourite part of the whole experience comes in the moments when a piece is so gorgeous that it will literally make me pause, my whole body stilling while my mouth gapes. When I’m there with friends I turn with wide eyes to look at them, wordlessly holding out the dress or skirt or bag, and said friends, often Giselle, will say ‘Oh you need that. That is so you.’ I feel validated and gratified. It IS so me, yes, thank you for acknowledging that; I must have it. Just such a scene happened as I rounded a set of shelves at the Collectif booth in September and clapped eyes on the Lulu Hun Mara heels, this time pointing them out, mouth wide, in glee to Collectif’s own designer Julia. I feel that same glee here today to be able to finally get these sweet, classic little ruby cuties on my feet.